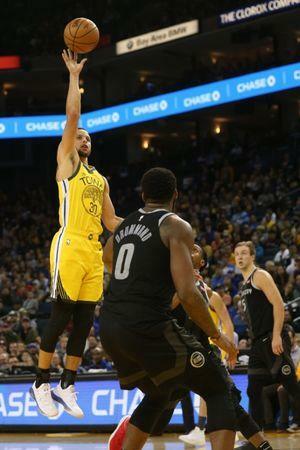 Stephen Curry returned from a one-game absence to hit five 3-pointers and total a game-high 26 points Sunday night as the Golden State Warriors shook off the embarrassment of a 35-point loss to the Dallas Mavericks one day earlier to turn back the Detroit Pistons 121-114 in Oakland, Calif. The Golden State win, coupled with Denver's loss at Indiana earlier in the day, allowed the Warriors (50-23) to move a half-game ahead of the Nuggets (49-23) in the race for the best record in the Western Conference. The 50-win season was the sixth straight for the Warriors, their fifth in a row under coach Steve Kerr. The loss dropped Detroit (37-36) from sixth to seventh in the Eastern Conference and further jumbled the four-team battle for the final three playoff spots. That duel also includes Brooklyn (38-36), Miami (36-37) and Orlando (35-38). 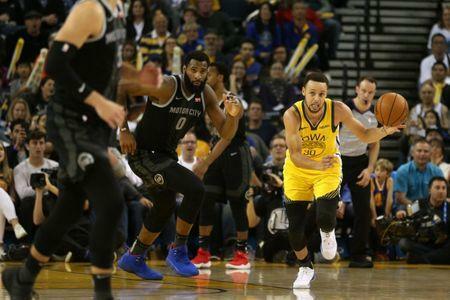 In a matchup between two teams playing the second night of a back-to-back, with both having lost Saturday, the Warriors finally created some distance between themselves and the Pistons with a 9-0 burst late in the second period. Andrew Bogut, Klay Thompson, Draymond Green and Kevon Looney had hoops in the run, which turned a 51-47 game into a 13-point Warriors lead. Green beat the halftime horn with a 3-pointer to push the Golden State lead to 63-49 at the break, and Golden State went on to lead by as many as 20 in the third period before the Pistons rallied. Reserves Luke Kennard and Thon Maker had 10 points apiece as Detroit, which lost Saturday night at Portland, got within 112-103 with still 4:59 to play. 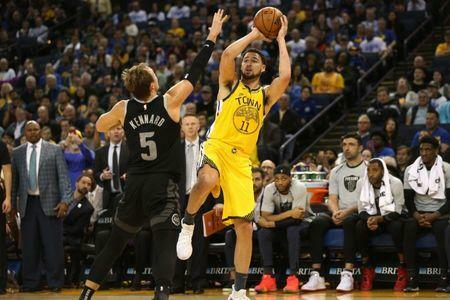 But Curry then connected on his fifth 3-pointer of the game, and the Warriors were able to hold the visitors at arm's length the rest of the way. Curry shot 5-for-10 on 3-pointers and Thompson 4-for-6, helping Golden State shoot 52.0 percent on threes (13-for-25). Golden State shot 61.3 percent overall. Curry also found time for a team-high nine rebounds. Thompson finished with 24 points, Green 14 and Looney 11 for the Warriors, while Kevin Durant recorded a 14-point, 11-assist double-double. Blake Griffin had 24 points and Andre Drummond a 12-point, 11-rebound double-double for the Pistons, who shot 46.4 percent overall and 12-for-31 (38.7 percent) on 3-pointers. The Pistons had beaten the Warriors 111-102 in their earlier meeting in Detroit. Kennard chipped in with 20 points off the bench for Detroit, while Ish Smith had 14, and Maker and Langston Galloway 12 apiece. The night began with an on-court ceremony during which Pistons center Zaza Pachulia received his 2018 championship ring from the Warriors. Pachulia played 14 minutes off the bench, totaling four points, four assists and two rebounds.